Last week, we’ve been talking about Twitter Analytics. 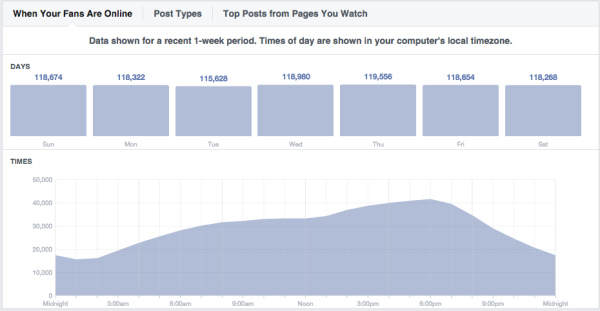 Naturally, this next article in our social media series is about Facebook Page Insights. This post is about all the information that can be found in Facebook Page Insights, and what we feel does and doesn’t make sense to look at for most of our visitors. It all depends on the kind of website you have, of course. During a local networking event I recently visited, someone asked me what Facebook does for your sites rankings. Good question, especially since Facebook blocks a large number of posts for Google (you have to log in to visit most stuff, right). Except for public posts, that is – these obviously are indexed by Google. Google does notice the number of links coming from Facebook to your website. The thing is, that when people talk about you on social media, you must be important for a certain topic, or one of your pages should be. If a page gets a lot of links to it, even from pages Google can’t read, Google can read that page on your website. And rank you for the subject of that page. There are more factors that should be taken into account, but this is the short version. 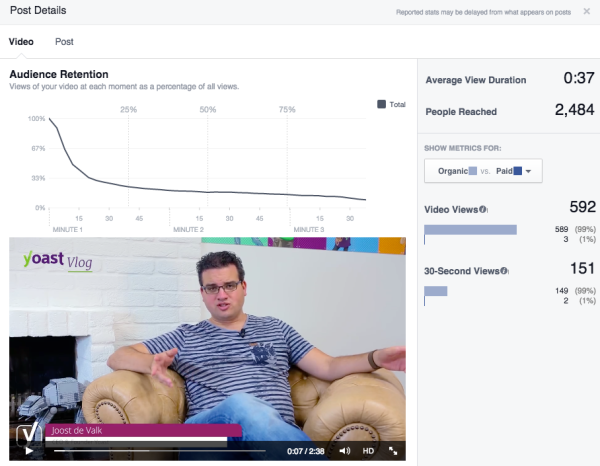 Add that to the fact that Facebook search is getting better and better, as Joost explained a few weeks back, and you’ll have enough reasons to dig a little deeper in your Facebook reach and engagement. Facebook Page Insights helps you do this. You won’t be able to access Facebook Page Insights if your page has less than 30 likes. An easy way to increase this for new pages is to buy promotion from Facebook. But usually, 30 likes is something that can be achieved quite fast by just asking people to like your page. A couple of hours after getting that 30th like, Facebook Page Insights will be available at the top of your Facebook Page. Please note that Facebook stores information about your visitors for 180 days. If you want to keep track of historic data, be sure to export it now and then via the export function in the main Insights menu at the top of your stats. Facebook uses Pacific Time, so be sure to translate times to your own timezone. I use Google for that. I’ve added a very small dictionary at the bottom of this post for terms specifically used by Facebook, like reach and engagement. I’d suggest opening it in a second tab or browser window, so you can check all the things mentioned below for your own page. 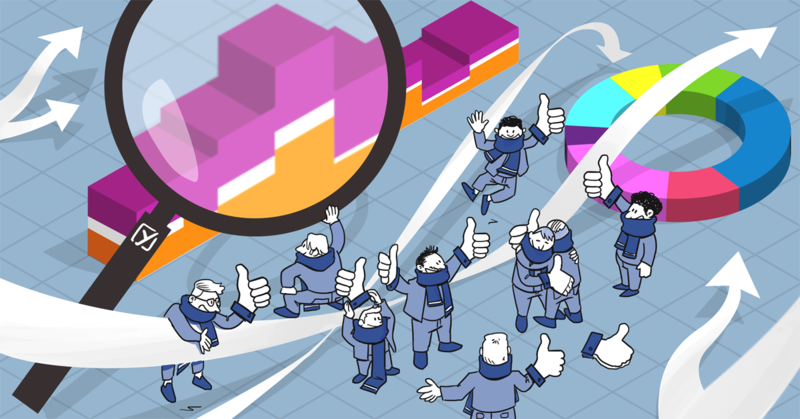 Facebook Page Insights provides you with loads of information about your visitors. The convenient thing with Facebook is that we all voluntarily enter all kinds of details about ourselves, knowing Facebook will use this to target ads and more. This information is pretty valuable for you as a Facebook Page owner as well. Facebook Page Insights will tell you for instance which posts had the most engagement from your fans, and what times your audience is on Facebook. When you click Insights at the top of your Facebook Page, you’ll see something similar. It was a bad week for us, or so it seems. You should always keep in mind that this is just one week, compared to the week before. We launched Yoast Academy’s Basic SEO Training on the 12th, so it makes sense that the week after that would have a little less reach or engagement. As with Twitter Analytics, I think the good stuff can be found on deeper levels in Facebook Page Insights. So let’s go to the first section: Likes! The Totals graph is interesting, as it will tell you if your fan base has grown or not. Facebook Page Insights tells you about the likes you’ve gained, but also about the likes you lost. That can be due to people not liking your page anymore, or Facebook cleaning up their database. Facebook requires members to be human, that is why we always recommend creating a Page for your business, not a Profile (personal). Facebook is pretty strict about this. It will also tell you the number of paid likes you received. I can recommend using Facebook ads / promoted posts on Facebook. It works. It’s as simple as that. As Facebook knows a lot about you all, and Facebook ads can be targeted right into your target audience, which can be adjusted per promotion. This will not only help you grow your likes, but it will also increase your reach for the next post! Clicking a certain day in the graph will give you a nice pop-up with numbers as well. And a lot can be filtered by clicking the legenda next to the graph, or by adjusting the date range at the top of the page. In the reach section, we find similar graphs and numbers. Where likes is about the click itself, reach is about the number of people that might have seen your post. Might have, as opening a page with your post below the fold and no scroll action, still seems to count as a view. Makes sense, right? Luckily, this might have caused just one person to unlike our page ;) If you post once per day, this will give you a nice overview of what type of posts to avoid or adjust to your audience. If your promoted post gets hidden, that doesn’t matter as much as a sudden increase in ‘dislikes’, of course. Promoted posts tend to surface quite often, and I might have hidden a few of your own promoted posts as well. No hard feelings. The Visits section will tell you what tabs on your Page have been visited the most. That can be your timeline, the info tab or the videos tab, for instance. Most of the times it’s your timeline. But it’s nice (and probably not more than that) to see that other tabs are visited as well. Make sure there is sufficient content or information on these tabs for just that reason. The second graph in this section could be more interesting to you. It tells you the referrals to your Facebook Page. For us, that graph just shows that most of our Facebook visitors are coming from our website. Nice to know. It becomes interesting when other websites besides your own and Google start to surface in this graph. Monitor it from time to time. This is data you won’t find in Google Analytics. Remember what I said about timezones; this is Pacific Time. For us, that means posting on Facebook around 2PM would be smack in the middle of our peak hour. Video post (you might have seen a few of these) like our weekly recaps, get roughly 2.5 times the clicks of link posts, with only twice the reach. That’s interesting and the reason we focus a lot more on video now. No, we are not going to make 37-second videos :) How many times have you started a video in your timeline, for instance on your phone, just because you were trying to scroll? Take that into account when checking these stats. But it is nice to know the reach of a video. The main group here is Men, 18-44 yo and a number of women as well. FYI, the third group of people that actually engaged roughly aligns with this second graph. It shows you should really check all stats before jumping to a conclusion. Next to age and gender, this section also shows country, city and language. Keep in mind that age and gender are found in our personal profiles, but country and city are derived from our IP addresses (might not be 100% accurate). Language is based upon the language settings you use for Facebook. Mine are set to English, but I’m actually Dutch. Check your settings here. You can see details on their top posts, for instance, and things like number of likes and posts in that week. It’s always interesting to see what works for them, right? 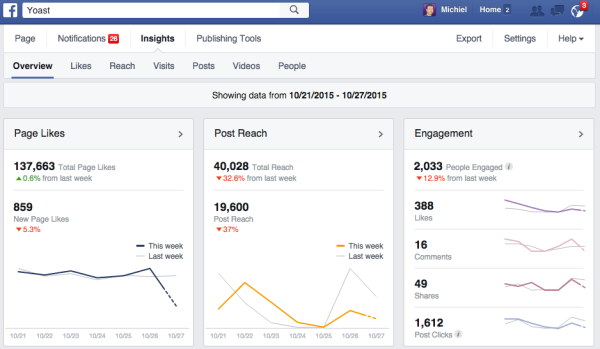 Let me know if you have any remarks or other valuable additions about Facebook Page Insights!